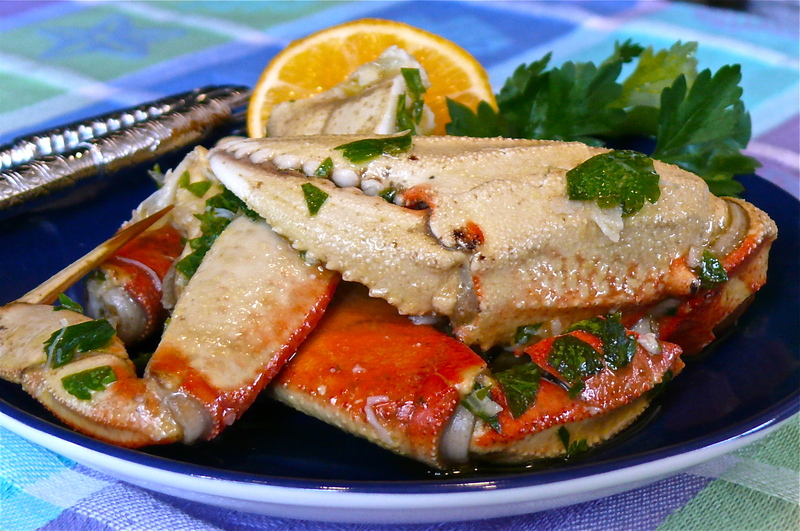 Cracked Crab With Meyer Lemon Vinaigrette | What about this? With Dungeness crab season peaking this month and with two Meyer lemon bushes heavy with fruit in my yard, I simply could not resist making Cracked Crab With Meyer Lemon Vinaigrette for a dinner with friends this past weekend. The fresh and fragrant flavors of lemon, garlic and Italian parsley complemented the delicate and slightly sweet flavor of the Dungeness crabmeat to perfection. Rounding out the meal was a loaf of fresh artisan bread, a colorful green salad, a bowl of hot tagliarelle with truffle butter (recipe to be posted at a later date), and a bottle (or two) of unoaked Chardonnay. There’s nothing like a night of great food and great friends! 1. To make the court bouillon, combine the onions, celery, carrot, bay leaf, peppercorns, salt, wine, and 8 qt. water in a large pot. Bring to a boil over high heat, reduce the heat to maintain a steady simmer, and cook, uncovered, for 20 minutes. 2. While the court bouillon is simmering, make the marinade: In a large bowl, whisk together the olive oil, lemon juice, parsley, and garlic. Season to taste with salt. 3. Return the court bouillon to a boil over high heat. Add the crabs, cover, and cook for 20 minutes (less if your crabs are smaller than 2 lb) after the liquid returns to a boil. Lift them out of the boiling liquid and set aside to cool. 4. Twist off the crab claws and legs and set them aside. Holding each crab from underneath, lift off and discard the hard top shell. Turn the crab over; lift off and discard the triangular tail flap. Pull off and discard the grayish feathery gills along both sides. 5. With a heavy knife or a cleaver, quarter the body. If necessary, rinse the body pieces very quickly to remove the yellowish “butter.” Gently crack the claws and legs with a nutcracker or mallet and put them in the marinade along with the quartered body. Stir well with a spatula and let marinate at room temperature for 1 hour, stirring occasionally. 6. Alternatively, cover and refrigerate the crab for up to 8 hours, stirring occasionally. 7. Serve the crab at room temperature or, if it has been refrigerated, serve chilled. Provide a nutcracker for each diner and a bowl for the shells. Meyer lemons give the marinade a particularly compelling fragrance, but you can substitute familiar Eureka lemons. The latter are more tart, so you will need less juice. Purchasing live crab is not a necessity, but certainly the fresher the crab the better the outcome. My husband purchased live crab from an Asian seafood market. If using precooked whole crab, skip down to step four. on February 22, 2011 at 11:25 am | Reply Tagliarelle with Truffle Butter « What about this?